Raise your hand if you’ve ever followed a diet that’s become or already is a fad. In all likelihood, probably about 100 percent of us have a hand over our heads. And that doesn’t even count the number of people who have followed some crazy exercise routine in order to try to make good on the promise of instant health and well being. Unfortunately, fads and crazes are often not backed up with science, and that can be detrimental to your overall health. Your body (and your mind) aren’t learning any good habits. But there’s something that’s been around for a while that’s getting renewed attention for its promise to retrain our bodies (and our minds) to eat better and more mindfully. 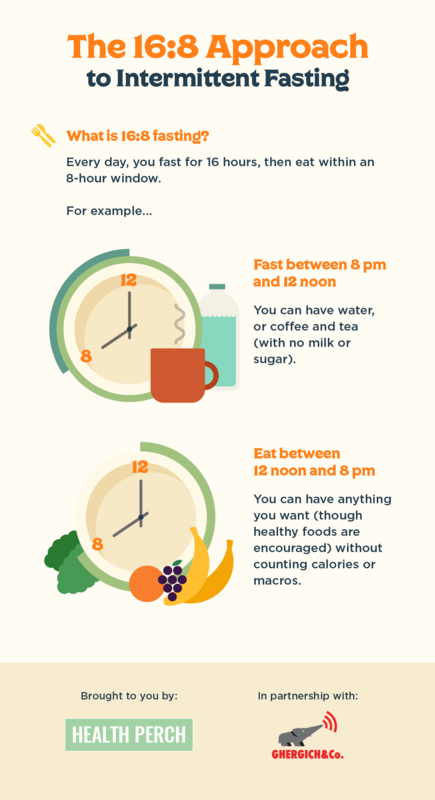 Called the 16:8 method, this is also known as intermittent fasting. Basically you go without for about 16 hours, then can eat for 8 hours (not straight, of course). How does it work? This graphic explains it. This entry was posted in Health & Fitness and tagged corporate wellness, Exercise, Fitness, fitness center, Health, intermittent fasting, Nutrition, sportswear. Bookmark the permalink.